And about time too. 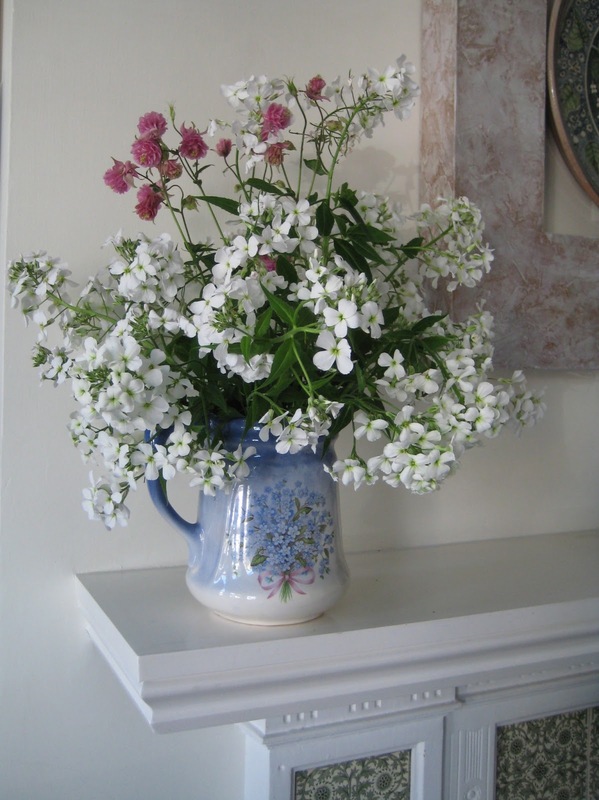 To celebrate its arrival, and the fact that our gardens are blooming at last, I post this bunch of sweet rocket plus a stem of pink columbine that got caught up with the rest. 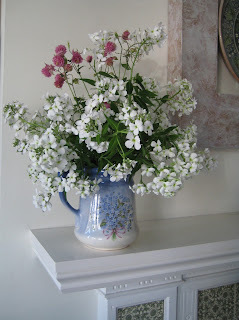 The scent indoors is both sweet and spicey - delicious! Beyond this jug of flowers, I'm afraid I have nothing to offer this time, I only dropped by to say hello because it's been a while since I wrote. Some RL paid work has arrived at my desk and I must pay it some attention. As usual in these situations, the mini world suddenly seems even more attractive and one longs to have time to 'play'. As things stand, I'll just have to find smaller tasks to do in odd moments - the dolls need wigging and I have several pairs of army boots to make from Fimo. Meanwhile, enjoy the season, wherever you are. so, sooooo pretty .... Oh for a 1/12th version!! Hello Em - thanks for your comment, I've been looking at the mantlepiece this week and thinking exactly the same! Unfortunately my talents do not lie that way, I certainly couldn't scale down anything as delicate as these flowers and really admire those who can. I spend ages browsing at the florists' stands at fairs - I have a weakness for 1/12 ferns as well.